Come Join Us on Saturday @ Shinsei! Shinsei continues to innovate and present incomparable special dishes along with our standard fare that is several steps above the ordinary! All complemented by our extensive wine list, craft cocktails, and more. Come Discover Friday's at Shinsei | No more delicious way to start your weekend than Lunch @ Shinsei • On Friday's dinner service is extended a full hour to 11pm. 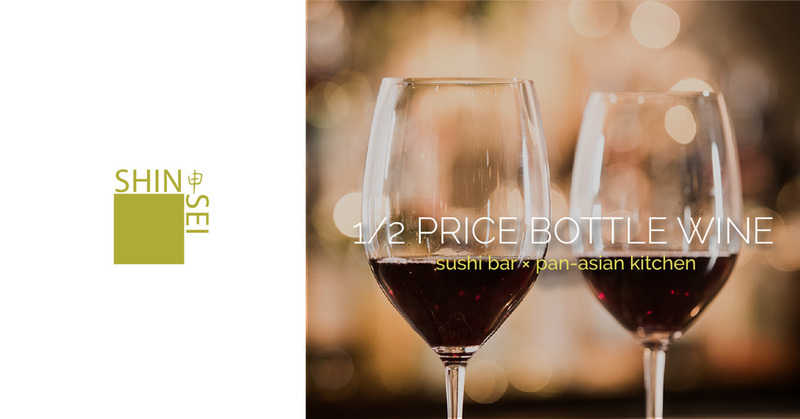 Have you experienced happy hour at Shinsei? Enjoy your favorite adult beverage (ice cold cocktails • sake • craft beers • full wine list) and if you're feeling peckish, select something from our starters or sushi menu. Then stay for dinner and explore some of our new dishes! Tuesdays are highlighted by 'best ever' Korean BBQ • 5-10p (limited quantities) Come Join Us and Discover Tuesdays @ Shinsei! Chef Robison continues to innovate and create incomparable special dishes along with our standard fare that is several steps above the ordinary! All complemented by our extensive wine list, craft cocktails, and more. Come Discover Friday's at Shinsei | No more delicious way to start your weekend than Lunch @ Shinsei • Each Friday Chef Robison creates a special dish just for lunch. On Friday's dinner service is extended a full hour to 11pm.